Not more than a day or two ago, I was taking out the garbage and left it toward the edge of the entryway as a suggestion to take it out when I left the condo. Yet, after I went into the workplace for a 20 min telephone call, I discovered Butters' on the kitchen floor eating a zucchini round alongside a gigantic tear on the base of the waste sack. I went nuts, secured the rubbish pack, and moved at a lighting quick pace to dispose of the zucchini. What's more, as any first time crazed canine parent, I googled "hound eating zucchini" to check whether I expected to do one more crisis vet visit. In any case, strangely, after much research, I found that crude zucchini cuts is really an astounding low-calorie eating alternative for mutts. So after the waste disaster, I took out a new zucchini and cut it up to check whether he would eat it, and he did! He ate it as well as he LOVED IT. He gave me those doggie eyes, asking for to an ever increasing extent. So on my next basic supply visit, I loaded up on a huge amount of zucchini for the little person. Be that as it may, much to my dismay that once I cut it up for him, he wouldn't go close it. What's more, this was the extremely following day. Oy. 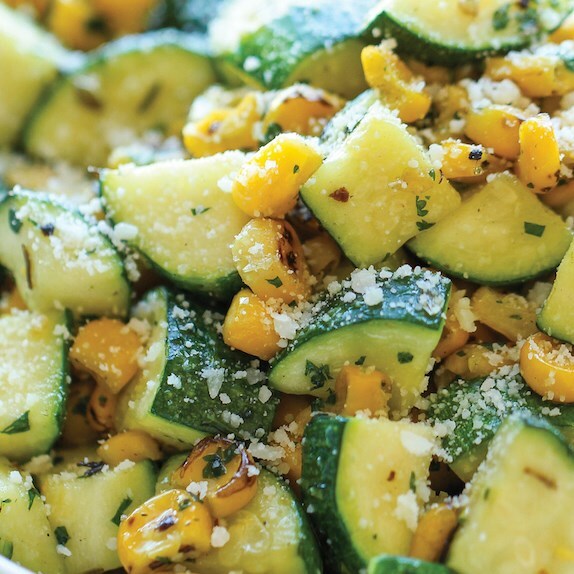 So with an end goal to go through it this zucchini, I chose to make an overly simple side dish with some simmered corn I had in the cooler, dressing it up a bit with dried herbs, a crush of lime juice and new cilantro leaves. However, you realize I couldn't abandon it in its present condition. I sprinkled on some Parmesan cheddar and considered it daily. It's staggeringly straightforward yet brimming with fun flavors with each nibble. The best part is that you can get this ready in only 10 minutes. You can't beat that!